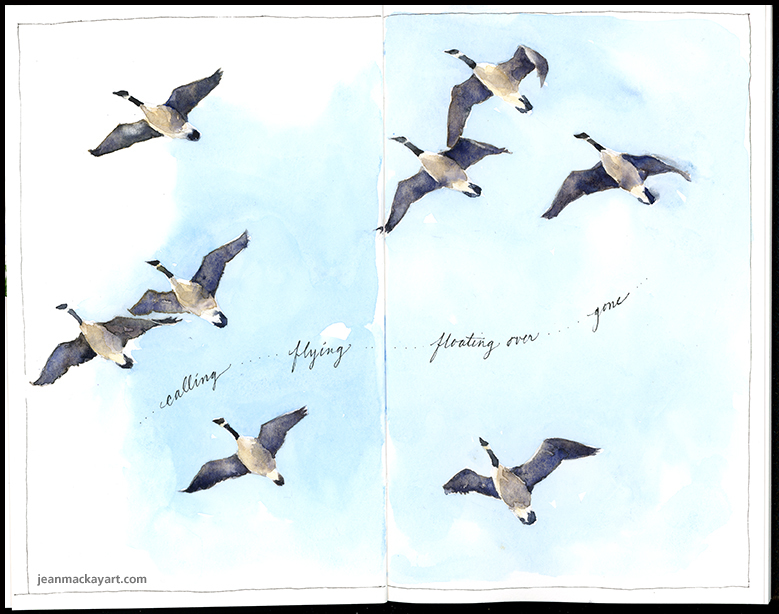 A small but vocal flock of Canada geese flies over our house every day now. They emerge from the tree line, calling to one another and, it seems, to anyone who will listen. I know better, but still, I hear them implore: look up! The maples will not be golden for long. Tips & Techniques– Painting birds in flight is challenging—and it takes practice. It helps to study the anatomy of the wing so that you understand its major feather groups. It’s also important to have a general sense of perspective so that you can begin to see how the plane of each wing moves and how they align together. Even then, it’s not easy. In addition to time in the field, watch videos to study flight in slow motion. I made several pencil sketches and marked the angles between wings, head, and tail to try to get the proportion and position right before starting this page. This entry was posted in Birds, Journal and tagged Autumn, Canada geese, nature, watercolor sketch by Jean Mackay / Drawn In. Bookmark the permalink. Good advice, thanks. Not so many geese here, yet. Plenty of monarchs, passing by. I’ve seen several monarchs too. Migration for all sorts of creatures underway. Thanks Karen. I’m glad to live in a place where there are geese– and all sorts of other wildlife. The fall is a beautiful time of year. Thanks for your positive feedback! Appreciate it! It is sometimes difficult to deconstruct what I did– writing it down forces that, and makes me realize how much there is to know and to practice. As a new reader and follower of your blog, I am quite taken with your paintings! They are simply stunning. I play at painting, and so am thrilled to see your tips and techniques. Thanks for being so generous with your readers! You are very welcome Dede. I’m glad you are following and finding things that are worthwhile here. Interesting. While I won’t be painting any time soon, I find it fascinating to learn how people do things. Hi Lisa- it is interesting to hear how other people approach things and what their process is. True for art and other pursuits. Not only did you render the geese well, but the placement on the page, and the shade of blue both really enhance the scene. I enjoyed looking at and reading about your painting. I saw another small flock of geese fly over this morning as I was driving down our lane to get to work. My heart just lifts when I see them, even though they were coming in for a landing at one of the nearby ponds. You’re right – the trees here in southern Indiana are the best fall version I’ve see since I moved here in 2005. Thanks Debbie– I think the geese that are flying around now are the non-migratory ones that are going to be here all winter. Glad your autumn has been colorful!